The Chinese Horoscope 2019 for Dragon warns us that if you want to succeed you will have to listen to the voice you hear inside. This advice will encourage you to find a middle ground between such opposing actions as concentrating as much as possible on a problem or running away from it when you have to take responsibility. You will lead a frantic rhythm of life throughout the year of the Pig, with almost no time to feel relaxed. Your ideas and thoughts will be very prominent and will be of great use to you in achieving your goals. However, these outstanding thoughts will come after a deep reflection on the subject to be dealt with before making any kind of decision. You should have no qualms about soliciting opinions from experts or older people who know more about a particular subject than you do. Those who were born in the years 1904, 1916, 1928, 1940, 1952, 1964, 1976, 1988, 2000 and 2012 are part of this horoscope. It will be a year in which you will devote much of your time to cultivating your love relationships. Between April and September, it will be a favorable moment for the beginning of a romance that could become a serious plan after a few months. 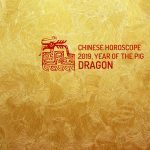 The Chinese Horoscope 2019 for Dragon states that this sign of the Chinese zodiac must learn from all those failures it has suffered in the past to know how to act in the new relationships it has. New people may come from both professional and social backgrounds. It will be a year in which the Dragon will have to re-establish the economic order in their house. In order to do so, you will have to pay the extraordinary invoices and update the accounting. Between March and May will be a good time to make a profit. It would also be a good time to make long-term investments. You can see the benefits much later. The possible obstacles that may arise in your family relations will disappear in the penultimate month of the year of the Pig. It will be a time for clarification of ideas regarding relationships with your relatives. As we can see in the Chinese Horoscope 2019 for Dragon, you will have to look for a balance between the moment of being concentrated and the moment of fleeing when it is necessary to take responsibilities. This balance will help to achieve success in your projects.